Was there life before pecans? Many Southerners might argue against it! Although Native populations had been eating and trading pecans for centuries, Europeans did not learn about them until Spanish explorer Cabeza da Vaca described them in the early 16th century. There was no Spanish word for this tasty discovery, so he used the word nueces (walnut). Later, however, settlers began using a term adapted from the Native (likely Algonquin) word paccane. 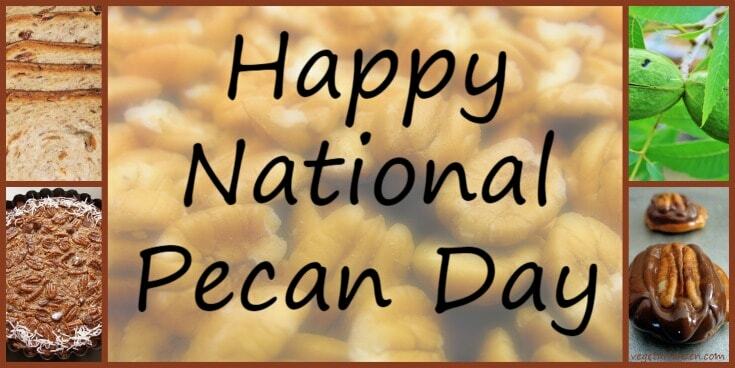 Today pecans are a Staple in southern cooking. From sweet to savory, appetizer to dessert, here are 10 delicious ways to enjoy pecans. Pecan Pie!! Who hasn’t heard of Pecan Pie, right? And there are tons of variations! Check out this corn syrup-free Old Fashioned Pecan Pie recipe from The Kitchn. Pralines. As opposed to French pralines, which use almonds, traditional American pralines use pecans. They also contain butter and milk or cream, which, when combined into a syrup with sugar, gives them a softer, creamier texture. Here’s a basic Pecan Praline recipe. If you’re vegan, try these Vegan Pralines. Salad topping. Adding pecans to a salad will give you a nice boost of protein, fiber, and healthy fats. Add to homemade granola or trail mix. Again…protein, fiber, and healthy fat! Add to cookies and brownies. Oh my goodness. Have you ever tried Pecan Sandies? Grind and add to breading. These Pecan-Crusted Tofu Nuggets are the perfect example. You could also use pecan-studded breading for vegetables! Spiced Pecans. Simple and delicious = simply delicious! Alton Brown‘s Spiced Pecans are both sweet and hot. Make pecan butter. Pecan butter is hard to find in the nut butter aisle, but you can definitely make your own! Check out Cookie and Kate‘s great Pecan Butter post. Make pesto. It’s easy to substitute pecans for the pine nuts usually called for in pesto recipes. Check out this recipe for Basil Pecan Pesto. Freeze them for later. If you’ve used your pecans every which way and you still have leftovers, this quick guide will tell you how to freeze them and how long they’ll keep.